Brazilian legend Pele does not believe that Barcelona striker Neymar can break his record as Brazil’s all-time record goalscorer. (Video) Brendan Rodgers chats with PELE in Anfield tunnel before Liverpool v Man United! “I don’t think [he can break the record]. I think it’s impossible to have a new king, a new Pele – my father and my mother closed the factory!” joked Pele in an interview for the Argentine edition of Goal.com. Pele made his Brazil debut in 1957 against Argentina aged just 16. He scored his team’s only goal in a 2-1 defeat to become the youngest ever goalscorer in international football at the time. He went on to score 77 goals in 92 games and win three World Cups (1958, 1962, 1970) in an international career that spanned 14 years. Neymar has currently scored 43 goals in 61 games since making his debut in 2010. 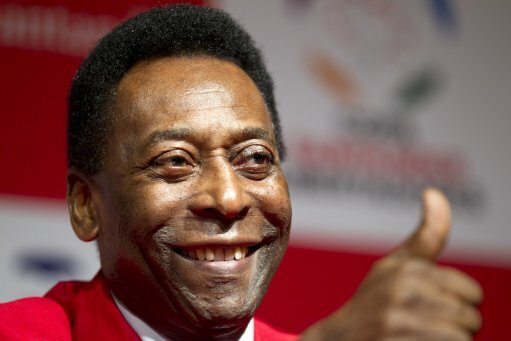 In the same interview Pele also claimed that if he was still playing today, he would be better than both Cristiano Ronaldo and Lionel Messi, the two players who are currently threatening to dethrone him as the greatest player of all time. “If you ask if Beethoven is still one of the best musicians today, I would say definitely. If I were able to play today, I would be the best. People forget that I had the gift of playing football and that is something nobody can compare to today’s world,” he said. In addition to a sparkling international career, Pele also scored 650 goals in 694 domestic games – 619 in 638 for Santos and 31 in 56 for the New York Cosmos.